The world of these cute monsters gets more real (and more noisy!) than ever before. Get the funky fluffies live on your screen for a fun-filled musical show! This book of digital magic brings the Moshi Monsters to interactive 3D life on your smartphone or computer, using the hottest new digital AR technology. You can find out how you’d look as a Moshi character, earn a super mask that makes you look like Tyra Fangs, or watch Zac Binspin perform an exclusive show on the palm of your hand! Fight off an army of Glumps, rescue kidnapped pop stars, and rack your brains in the Puzzle Palace. 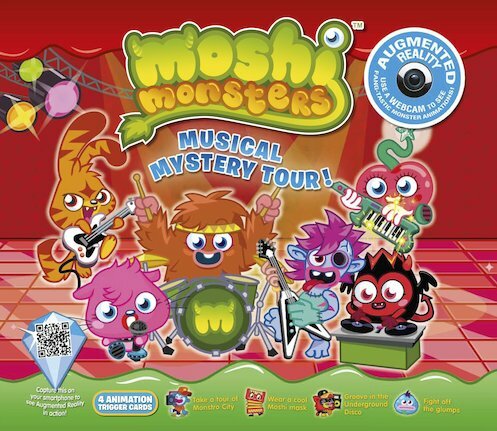 Venture further into the monstrous Moshi world!